So I thought I might keep a written record of the steps taken to turn this Symbol into a new Scouting kit for myself, one with all the bells and whistles. I will go step by step, to help illustrate what all is involved in the process, and discuss some tips and tricks that you may or may not know that might help cut down on costs and 'grind'. Hopefully, some of the unpleasant parts will be diminished for you, and more fun can be had as you work with your own legendary items! Please, please, please feel free to leave comments if you know of different or better ways to do things than I mention! Before we truly begin on our item, let us talk about currencies. 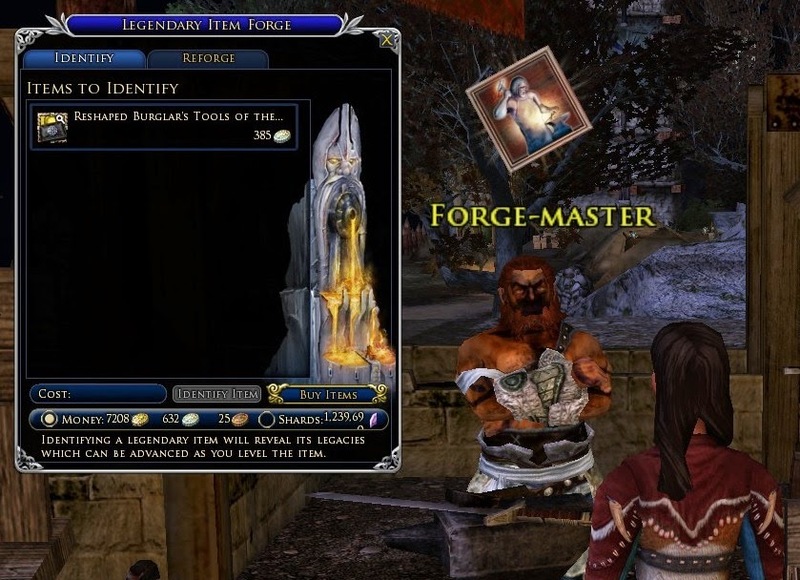 When it comes to Legendary Items, there are four different currencies that can be used to barter for things regarding them: Turbine Points, Gold, Marks and Medallions, and Shards. Of those four, Shards are the only currency that deal with Legendary Items in exclusivity. What this means is, since the other three currencies have value outside of the Legendary Item system, we first want to look toward Shards as the currency we spend toward them. - Shards can sometimes be granted when combining relics and a critical success combine happens. There is a Scroll of Combination, purchasable in the Store and once found in the Lotteries, that greatly improves the chance of this occurring. I do not believe they can be found as treasure, but please mention it below if so! 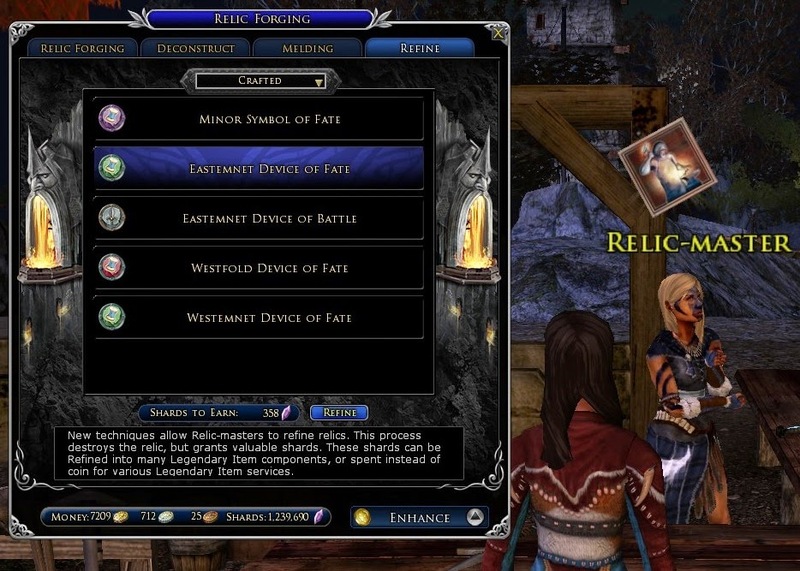 - Relic-masters can convert relics into Shards, through the process of refining (the last tab in their menu). The higher tier the relic is, the more shards can be earned from them. That last process is one I want to discuss, particularly with regard to crafting. 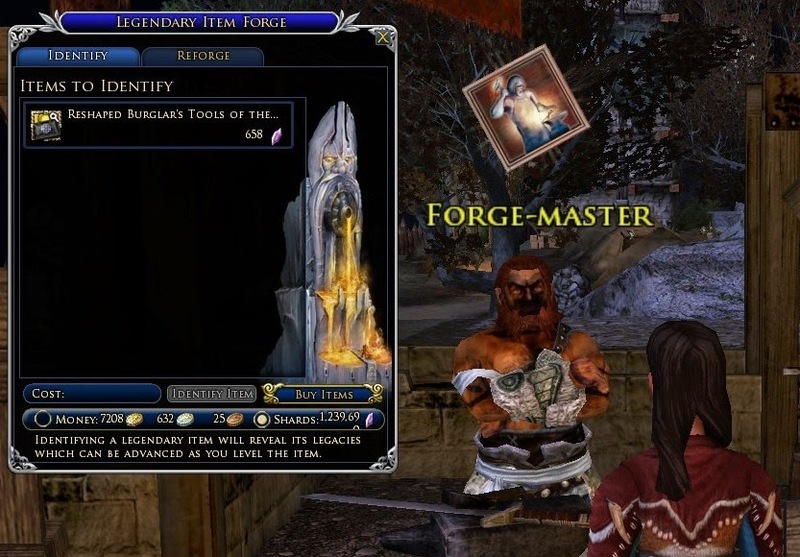 Most everyone knows that those who are skilled in a craft, and who are also in good with their guild, can learn how to craft relics able to be placed upon legendary items. What may not be as well known is that those relics can be refined into shards, the same as any other relics. What this means is that there is a way to convert any of the excess resources you may have stored away into the currency of legendary items! And it can add up if you do so regularly. 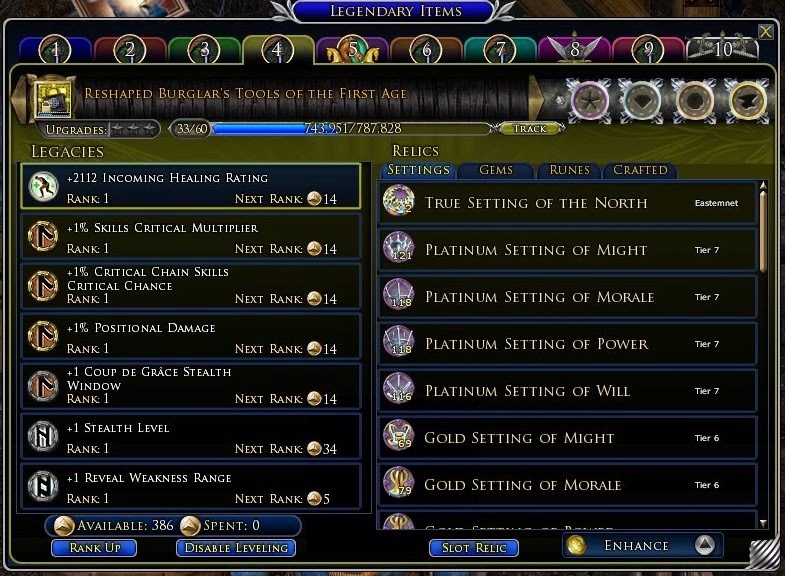 What I do is keep on hand the materials to make the 'lesser' crafted relics (the ones in purple text) for the last three crafting tiers (Currently: Westfold, Eastemnet, and Westemnet). You can craft one of each of these every 2 days and 18 hours, but I just do so twice a week. I also run to the mine in Hytbold once per week, to fetch a Compendium of Middle-earth, Volume IV as well. This enables me to craft the 'highest' Eastemnet relic (the one in the golden text) once per week as well. At 95 trainings, this can be done very quickly. So, what does all this add up to? Let us go to the Relic-Master! So, (258 x 2) + (358 x 2) + 1,074 + (458 x 2) equals... *counts on her fingers*... 3,222 shards per week, using piles of resources you likely have just sitting around! Over the course of a year, it will add up to over 150,000 shards, taking maybe 5 minutes per week, including the time to fetch that Compendium, maybe 1 minute only without that step. But isn't that a ton of resources that you need, you ask? Not really! 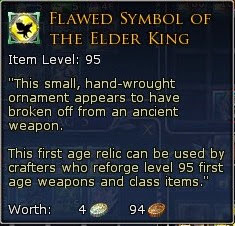 Each of the lesser relics takes 2 of the Highest Grade resources for that tier, and 1 of the lower. 2 stacks of the highest (100 per stack) and 1 stack of the lowest will get you just about through the year! But that is not the end. Shards are shared by all of the smialmates on that account. If you have some crafters who belong to a crafting guild, but who do not really adventure much, they can also craft these relics and refine them into Shards to be used by your more adventure-minded smialmates as well, even while they progress toward Proficiency and Mastery at their craft! 7 Smialmates doing this over a year would earn over one million shards, to be used however you like! "Please, appraise this bundle, sir! Mmm...385 silver? Can I pay you in another currency, maybe? Oh, you take Shards as well? Very nice!" Not the best, unfortunately. 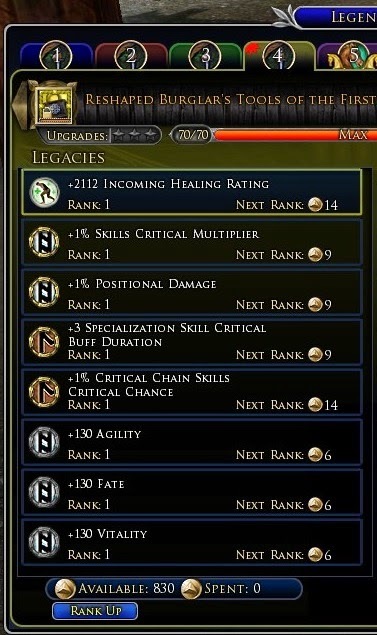 In fact, with all of the legacies being Tier 2, the same tier at which replacing a legacy with a scroll begins (more on this later! ), this item will require the largest 'grind' possible within the Legendary Item system in order to get it to where we want it to go. I am working on this as I write, so I did not know this would happen! I guess we will see how much of a grind is really possible. At any rate, two of the three legacies are keepers, while Hedge Your Bet will have to go. I know this because, before I put the very first stitch into this bundle, I knew exactly which legacies I would have it end up with, and I have been preparing to have them ready in the event that I did not get the ones I wanted by random chance. How is this? 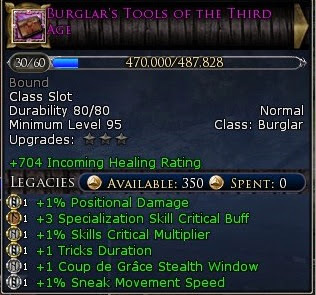 By deconstructing items at Level 31 or higher, we not only get some relics for the item, but we may also choose one of the legacies of that item to be scribed into a scroll. 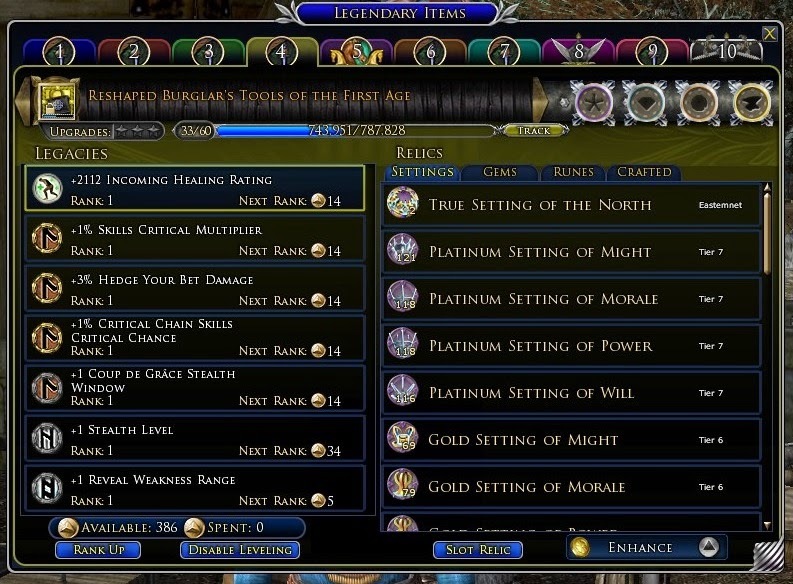 With so many of the rewards in Middle-earth moving away from a system of merit and toward purely random chance, it is nice to have something toward which we can make solid and steady progress! We can overcome our initial misfortune and still end up with the exact item we want. It will just take a little more effort is all. Usually, you will find yourself exploring new lands, performing new quests, and earning new levels far before you will even start to think about working on a new Legendary Item. Why not start preparing for one then, while things are not yet a grind? 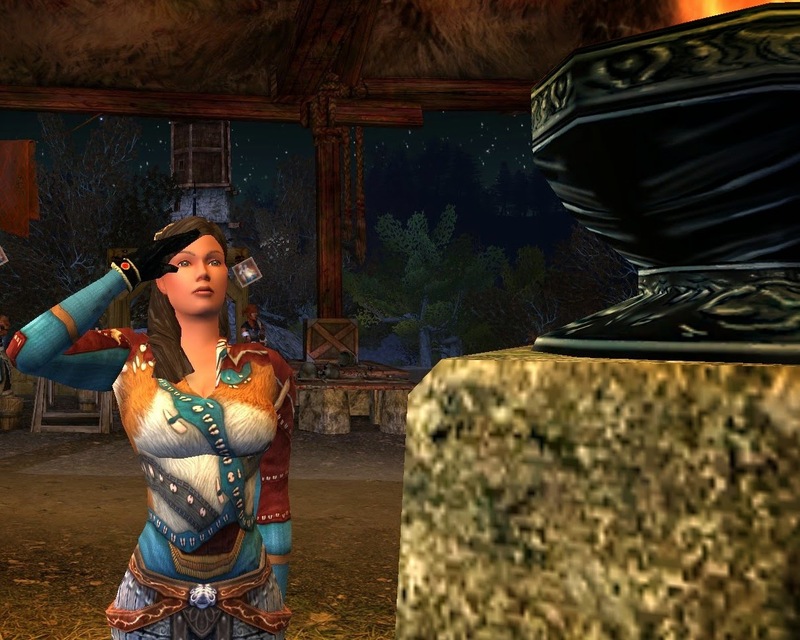 As you are questing, exploring, even visiting the festivals, have some items on hand that will progress as you go. Then, when it is time to deconstruct them, choose scrolls with the legacies you will want later and keep them in storage. That way, when the time does come to work on your new item, the 'grind' of preparing scrolls is already done! Legendary Items earn experience in a number of ways. That experience gets them to where we can deconstruct them for relics, the scrolls from above, and other useful things. How can Legendary Item XP best be earned? 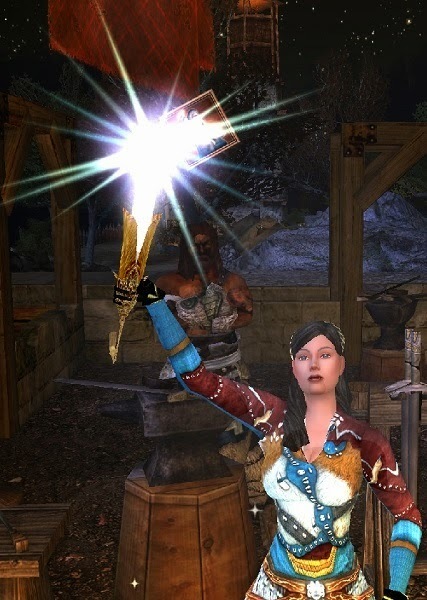 C. Multitasking with Legendary Items - The More, The Merrier! We can earn experience for our legendary items in many ways. Every foe we dispatch earns us some. Every quest or task we perform earns some as well. Even quests at the festivals make our items better! Running off the shrews in the gardens of Duillond and poking fun at 'tweens in the Hedge Maze north of Bree-town will make your items grow! You can do just about anything but sneeze and earn some progress toward cycling through your legendary items. They progress at a fairly quick rate, provided you are actively doing things. But would twice that rate be better? Of course! Did you know that, for each legendary item beyond just one that is currently progressing, you earn roughly 20% more Item XP than what is displayed (the amount varies depending on the number of items being worked through at the same time. 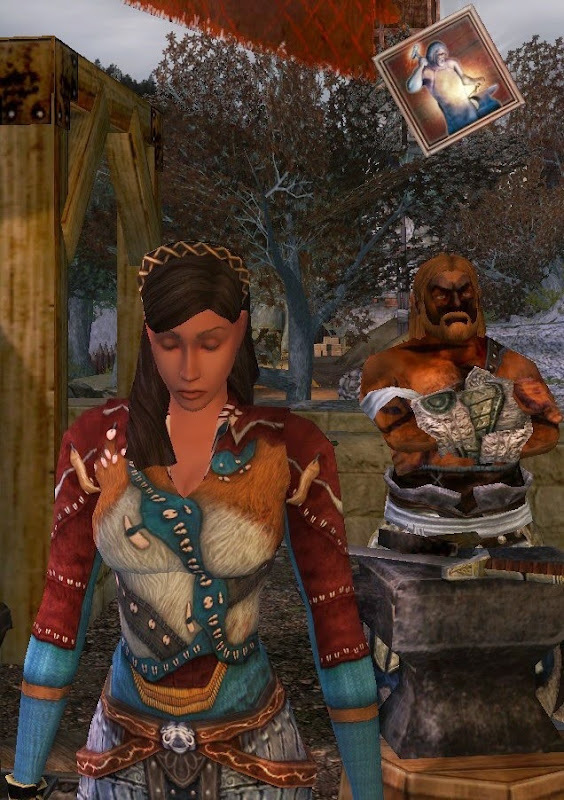 Thanks to HaleElven for pointing this out!)? 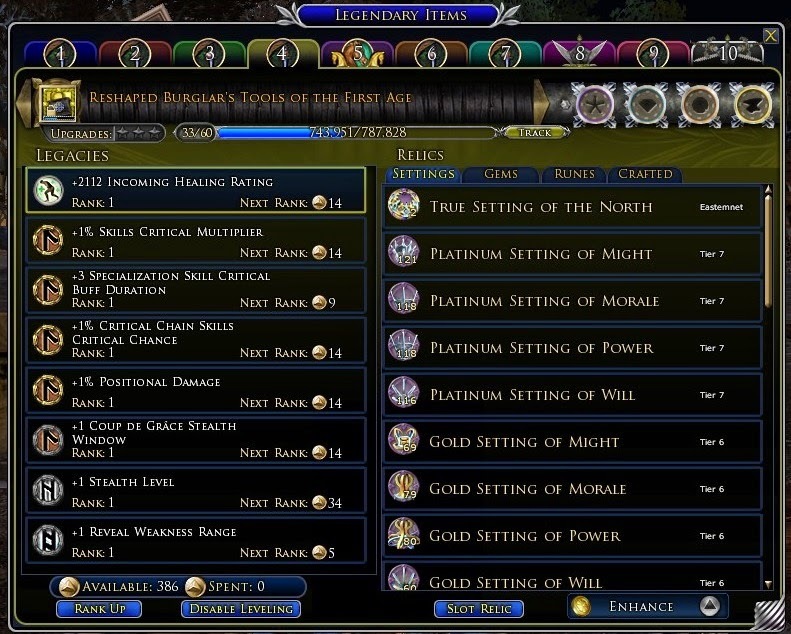 That bonus is not mentioned anywhere that I am aware of, but it is there (Actually, this was covered in an old developer diary. Thank you to Terrorite for pointing this out!)! The more items you are currently working on, the greater the overall gain. Most everyone will have one legendary weapon they wield and some other legendary item, depending upon the Class they took at the Academy. Also, most will have a bridle for their steed. Since we all start with 6 available slots for legendary items, that means most will likely have 3 spots open for items to cycle through. You can purchase more slots (up to 10 total) in the Store as well, which I recently did when they were on sale. In my case, I keep two stickers and two Scouting bundles, one pairing for each of the Scouting disciplines that I use, depending upon the circumstances in which I find myself. 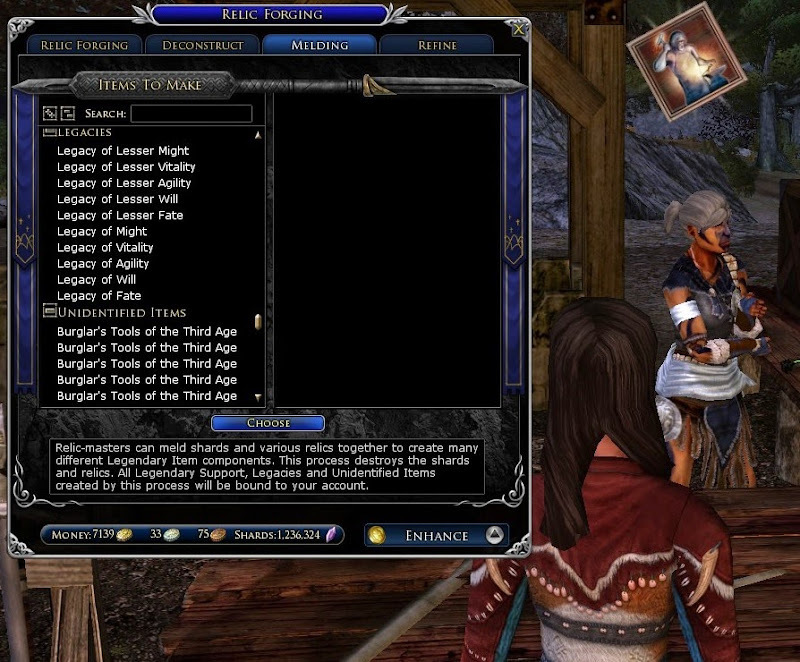 With one bridle as well, that leaves five slots open for items to work through. For every 1,000 Item XP I earn, I am really getting 1,800. This is an invaluable aid for lessening the 'grind' toward earning relics, replacement scrolls and so on. Take advantage of multitasking as best as you may! Five items at a time is too much hassle, you say? What I do is use the Item XP runes to make sure all of my items have nearly the same experience if any get ahead or behind. That way, I can reforge all five at once when they need it, deconstruct all five at once when they are done, and start a new batch of five all at once thereafter. That creep was holding out on me, I know it! 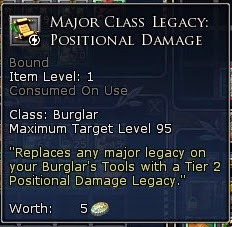 There are two different groupings of legacies for all legendary items: Major Legacies and Minor Legacies. When a Legendary Item is first identified, it will always start with three Major Legacies. 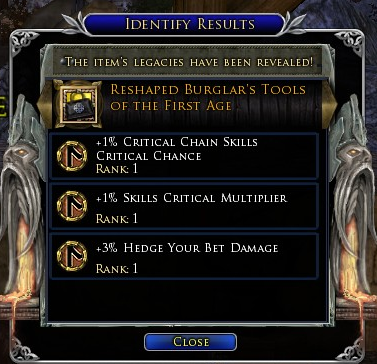 The first three times it is reforged (at levels 10, 20, and 30), you will be shown two legacies at random, one of which you may choose to add to your item. 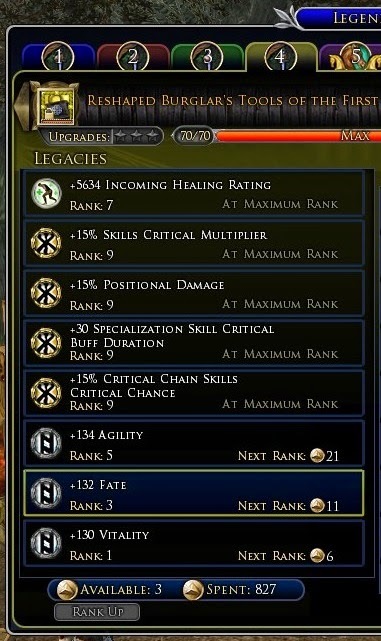 The legacies shown at these reforges are Minor Legacies nearly all of the time, but there is a small chance (maybe 10-15%), that you may have been given the option of adding another Major Legacy instead. Sometimes, very rarely, both options will be Major Legacies. In general, Major Legacies tend to be far and away more powerful than the Minor Legacies. Before the changes to the Trait Trees, it was almost always the best choice to take any Major Legacies offered when reforging, even those that were not specifically wanted. You could then replace that legacy with another major legacy that was more desirable and have quite an item on your hands! Unfortunately, many of the legacies now concern skills that are gated behind the different trait lines, rendering those legacies all but worthless unless you are working within the trait line to which that skill belongs. It is worthwhile to plan out which legacies you would like to have if you end up with the option for an additional Major legacy or two, and also to know in advance if having extra Major legacies is not worth trying for, due to the gating of their relevant skills. Major legacies have a golden ring, while Minor legacies have a dull, silver ring. 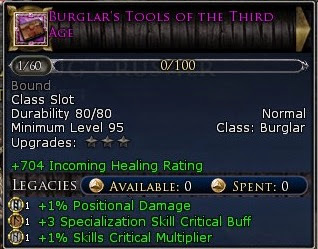 As you can see, I was not given any options for a Major legacy during my three reforges. But, not only that, none of the options I was given had any legacy that I wanted much at all! In all of the years that I have been working with legendary items, this will be the first one ever which will have all six legacies at Tier 2 before I begin righting this wayward ship and steering it back on course! But we will, and this is good in a way, as it will be a wonderful example for how to reclaim the worst possible Legendary Item and what is involved in order to turn it into gold! So, we know what we are working with now. We will have three more reforges, each of which will allow us a choice between two of its existing legacies to raise one of them by one tier. Remember, the Tier of a legacy dictates how many legendary points have to be spent to raise that legacy's rank. The higher the tier, the less you need to spend. 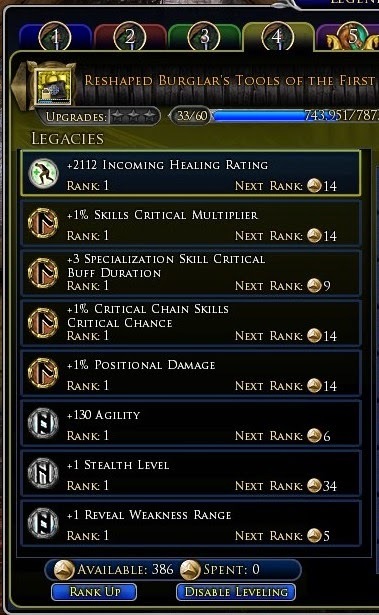 You can tell what tier a legacy is at by how many lines form its symbol. In the above rendering, the first four legacies are Tier 2, the next Tier 3, and the last Tier 4. But, as I have mentioned, I do not care much for the legacies that are currently on the item. 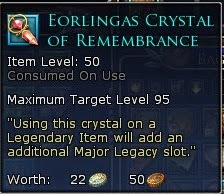 Any reforges past level 30 will raise the tier of the current legacies on the item, rather than granting new legacies. Now is the time to use the scrolls we have been saving to replace the unwanted legacies on the item, before we start the reforging that will increase the tiers of legacies we may not want! Last edited by Valkrist; Jun 22 2014 at 12:17 PM. Now the Scouting bundle has four Major legacies, the four I had planned on from the beginning. There are eight Major legacies for a Scout's kit. Unfortunately, four of the eight are worthless while in the Quiet Knife line, so there is no real motivation to try and get more. Aside from having to spend a Crystal of Remembrance, and the lowly tiers of the legacies themselves, this was the best outcome, at least regarding Major legacies. Relic-masters have an incredible variety of wares for your legendary items. Through the process of melding (the third tab on their menu), they can use a given number of your shards and create from them a whole host of useful things! One of those things is creating a Minor legacy scroll that will boost one of the wielder's given attributes (Might, Agility, Vitality, Fate or Will). You can even choose between a Lesser version of the scroll (which grants a Tier 2 Legacy, costing 943 shards) or a Regular version (Tier 4, 1,886 Shards). These can also be purchased with Medallions from a vendor in Harndirion in the Enedwaith as well, with Moria medallions there, and many other ways if you prefer! Last edited by Valkrist; Jun 10 2014 at 01:28 PM. Yay! Now, instead of having a legacy that was virtually worthless, I am getting +130 Agility without spending a single point on that legacy! How much higher can it go? Not much higher, it looks like. To gain 8 more points of Agility, I would need to spend 163 points. But, even so, this legacy is tremendously useful! 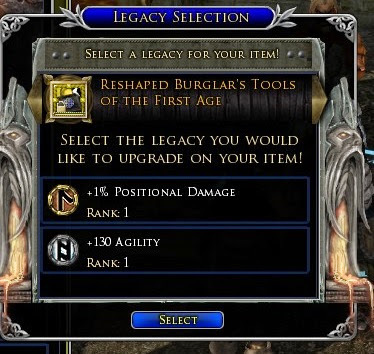 If you were to take a First Age Legendary Item and increase the Tier of every single legacy on it to the highest possible (which is Tier 6), you still would not have enough points to increase them all to their highest rank. 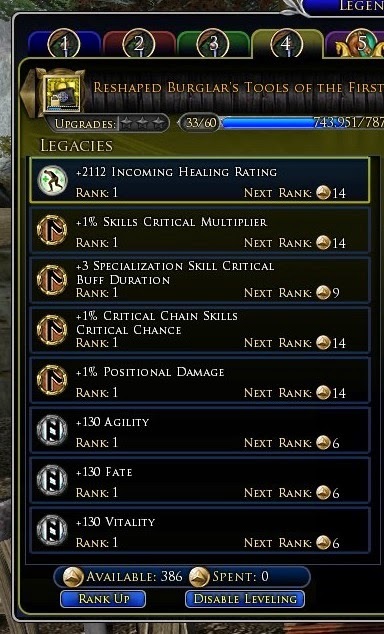 Front-loaded legacies are an incredibly valuable tool, because most of their value is gained from just having the legacy at Rank 1. 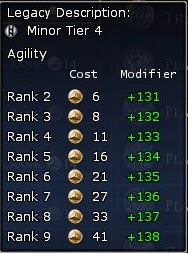 I can leave this Agility legacy alone, rather than spending 163 points to go from a bonus of +130 Agility to merely +138, and spend those points I saved on legacies that have a more linear progression. The Critical Rating begins at +1,304, with a maximum potential of +1,368. 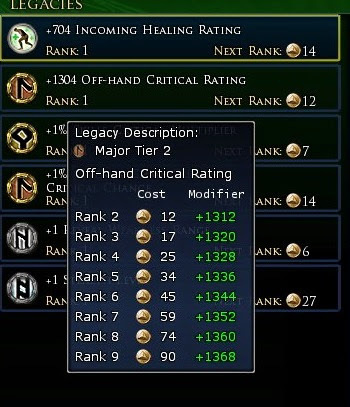 The very first rank of the legacy holds over 95% of its possible worth! And look at the cost to increase it at Tier 2! 356 points, nearly half of the maximum possible. No thanks! When planning for the legacies on your legendary items, be sure to consider where front-loaded legacies can help save you some points, and which ones are most worthwhile for you! Last edited by Valkrist; Jun 09 2014 at 08:38 AM. Now, it is time to do our three reforges and see which legacies we can tier up, yes? Not quite, and not only three! Before we start those, let us look at two more Legendary Item scrolls that will be of use to us! The Scroll of Delving will grant our Scouting bundle an additional 10 levels worth of advancement, while the Scroll of Empowerment will allow us to choose one Legacy and raise its Tier by 1. These are the final pieces that will let us bring the item that started so horribly out of the darkness and allow us to make it shine! Firstly, since the Delving Scroll increases the item's maximum level from 60 to 70, it gives us an extra reforge, which is basically a free Scroll of Empowerment, save for the random chance involved. But you see what we have done, yes? By switching all of the legacies on the bundle to ones which we want before starting those reforges, we have insured that we will almost always have a good option available to us! And we can, or at least we can barter for them with differing currencies, from the Relic-master. 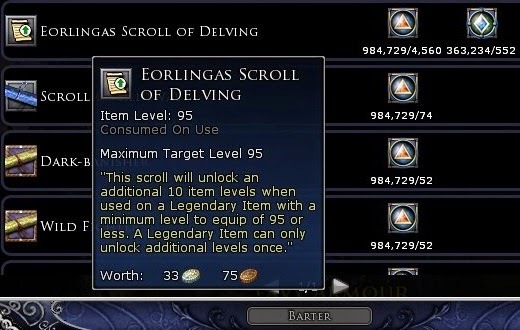 - Eorlingas Scrolls of Delving: 4,560 Marks and 552 Medallions from the Skirmish Camp, versus 19,500 Shards from the Relic-master. - Eorlingas Scrolls of Empowerment: 1,368 Marks and 173 Medallions from the Skirmish Camp, versus 28,440 Shards from the Relic-master. Notice how the Relic-masters place more worth on the Empowerment Scrolls than the merchants in the Skirmish Camps, but less on the Delving Scrolls than they do? 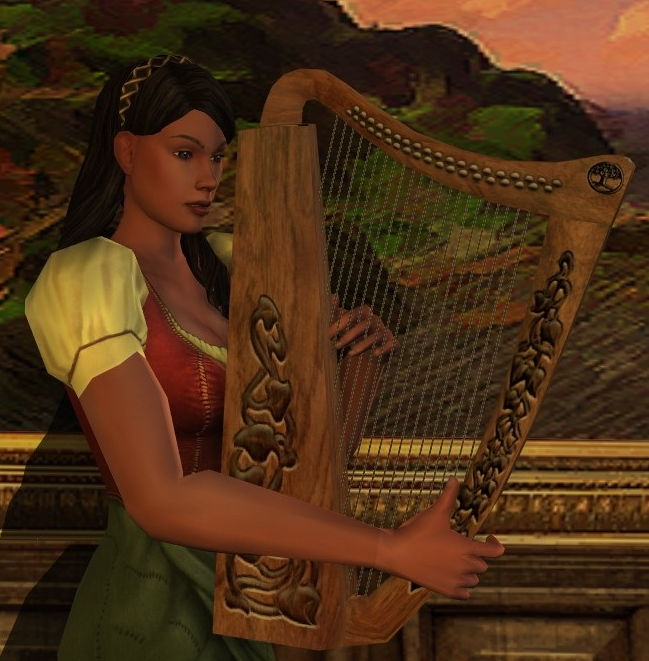 Just like in Bree-land, it pays to shop around! We only need one Delving scroll but likely a slew of Empowerment scrolls... I think I will barter for the Delving scroll with Shards, and use Marks and Medallions for the Empowerment scrolls. And, finally, we are off to our reforging. Here we go! Remember, front-loaded legacies have most of their value in just being on the item. Because of that quality, increasing the Tier of those legacies is likely not the most efficient choice, as you will most likely rank up the legacies that progress more linearly first. I should have mentioned that all of the Major legacies I have chosen progress in a linear fashion beforehand, but you all probably knew the answer anyway! Now, the only thing left to do is to decide how many Empowerment Scrolls to use to increase the tiers on the legacies we want to rank up. Well, I do not mess around when it comes to these things! And we are pretty much done! Last edited by Valkrist; Jun 09 2014 at 07:56 AM. We may as well finish it off for a final rendering, though! What is left? - 3 Eorlingas Star-Crystals would look lovely as an accessory, wouldn't you say? - Settings, Gems, and Runes! How did we forget those! And the transformation is done! From the worst beginning to a legendary item possible, into something with which the most dedicated and perseverant raider Scout would adventure. That is an important thing to note, in my opinion. No longer are the best items gated behind content or restricted from anyone. With enough effort and perseverance, we all can reach for these things. H. The Reckoning - What was the cost? But there is a cost. There is always a cost. What was the final cost to craft and work this bundle into what it eventually came to be? - Around 20-30 minutes worth of time for the LI Scroll from Snowbourn, assuming we did not have 50 of their tokens lingering in our wallet! - The Setting, Gem, and Rune I chose were all True Runes of the Eastemnet. The total cost for all three: 29,952 Shards and 12 Tier 9 relics of any kind. - Using the crafted relics to earn shards, and assuming no other shards of any sort, this is about 18 weeks worth of crafting relics, and maybe 30 minutes to an hour of time, once you have the resources ready to go! - The marks and medallions... If you had a committed group to earn these with, and used a few of the +100% Mark Acquisition scrolls, you could probably earn this many Marks and Medallions in about...4 hours or so, give or take? 400 Marks per Sambrog run, doubled is 800, assuming 10 minutes per run, which is very slow, is 4,800 Marks per hour. But if that is not for you, just normal and unhurried adventure will do! You can earn 993 Marks and 211 Medallions or so - per side objective - in the Deeping Wall Epic Battle raid. The side quests in Fornost give 80 Medallions each! Just clicking on three catapults to break them gets you 80 Medallions, and another 100 come from finishing the instance. There are so many choices, and that is what it is all about in the end. Do what you enjoy and let them come! So, let us say that you have drawn a line in the sand. You have decided, for whatever reason, that you simply do not wish to put anything more than the most nominal effort toward your legendary items. What then? I still believe you can work toward a very nice legendary item, one that will be closer to the butterfly above than the caterpillar it began as. Let us see what we can do! The first thing to recognize is that we have an advantage toward ensuring that we get off to a good start versus dealing with the First Age kit. Why? Rarity. We are not likely to have multiple First Age kits, from which we can choose the one with the best legacies from the start. But 3rd Age kits are commonplace. 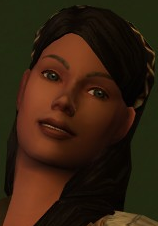 We can ask kinmates to send us any they might find, buy them cheaply at the Auction Hall, and find many on our own! All three legacies are ones I would want and, while the tiers of the legacies are not stellar, they are not so bad, either. On to the first three reforges! Last edited by Valkrist; Jun 09 2014 at 08:22 AM. Now, we work through our remaining reforges, each acting like a Scroll of Empowerment. Remember not to raise the tiers of front-loaded legacies! 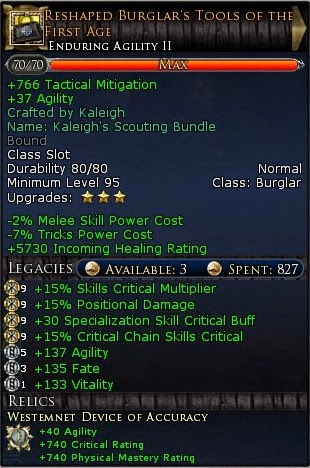 Well, we were unlucky on the last reforge and had to choose between the two Stat legacies. Still, we have 3 front-loaded legacies, and three others just shy of being ranked fully. All in all, not bad, even compared to the Butterfly! 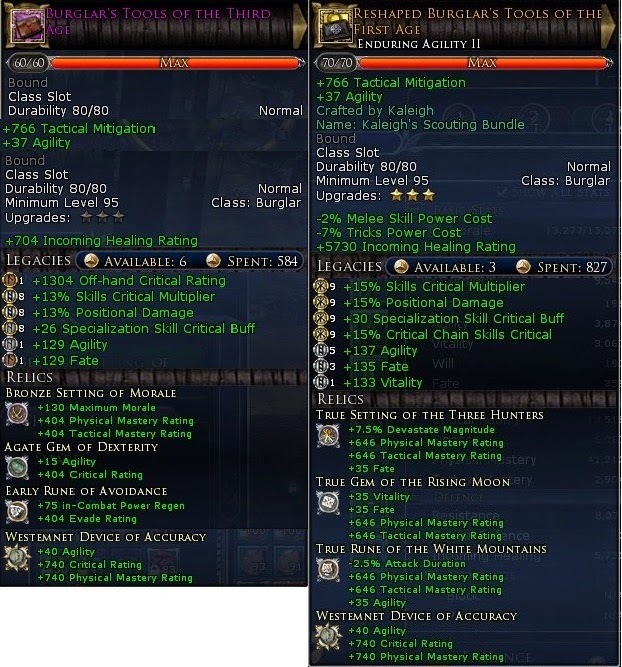 The crafted relics and LI Scroll are identical. 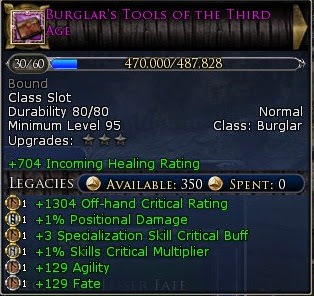 The two Stat legacies are nearly identical, as are the three legacies shared by both (Positional Damage, Skills Critical Multiplier, and Specialization Skill Critical Buff). In exchange for the Butterfly's extra linear legacy, we have a front-loaded legacy giving us near its full worth. 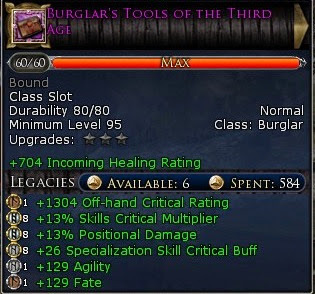 Basically, the only things we are down on at all really are the extra Stat legacy on the Butterfly and the quality of the relics. But wait until you see how much we saved! That is it! We can approximate quite well the best Scouting kit possible in the game for so little effort that it is difficult to imagine anyone not wishing to do so! But we all have that choice, and Choice is what makes for an inclusive game, one that is welcoming to most everyone. In the end, the Legendary Item system, like everything we do in these lands, is all about choice. A clear vision of what the Legendary Item system entails and a clear understanding of what is possible within that system, relative to the amount of effort required, simply helps us make better choices. I hope this long script has demystified some of all that is involved with the Legendary Item system and what the possibilities within it are! Comments, questions, critiques? Please, scribe them below! Last edited by Valkrist; Jun 09 2014 at 08:35 AM. Did you know that, for each legendary item beyond just one that is currently progressing, you earn 20% more Item XP than what is displayed? That bonus is not mentioned anywhere that I am aware of, but it is there! The more items you are currently working on, the greater the overall gain. This is absolutely fantastic and all inclusive. You spent a lot of time on this and it shows. Well done. 2) Instead of spending shards for stat replacement scrolls head over the the legendary items vendor on top of Harndirion in Enedwaith. You can get each stat scroll for 200 or 250 medallions a piece. Easier than the shards in my opinion but I never had anywhere near as many as you! Yes a very good article Valkrist i consider myself reasonably okay with the Legendary system but i still found some useful tips in the article. Thank you for pointing this out! I knew it had to be discussed somewhere. I added this in and gave you credit for pointing this out. I hope that was okay? @ Geldeger and Atrixzia: Thank you both! Did you know that, for each legendary item beyond just one that is currently progressing, you earn 20% more Item XP than what is displayed? That bonus is not mentioned anywhere that I am aware of, but it is there (Actually, this was covered in an old developer diary. Thank you to Terrorite for pointing this out!)! The more items you are currently working on, the greater the overall gain. Also, it's covered in the wiki page. But, more to the point, simply saying it adds 20% is wrong. 2 LI's = +20%, 3 LI's = +24%, 4 LI's = +16%, 5 LI's = +20%, 6 LI's = +36%, 7/8 LI's = No change. This is a fantastic guide! Many thanks for that! Wow what an amazing guide, thank you. One little tidbit that I do - once I am L76+ I will always have a full set of trash LIs leveling and then decon them at when maxed. Starting at L76 LIs you always get T5-6 relic for max level decon and the ixp run you get is always 800k+ (I can't remember the exact lowest amount). Just apply the ixp runes to the next group of LIs and then decon when they are all maxed out and rinse/repeat. With roughly 230K ixp at most to max it goes fairly quickly and the your relic pool will grow substantially. I will often use the smaller ixp runes to get all of my LIs to 50 to reforge before heading out to do more adventuring so I only have to vist the Forge/Relic Master at decon and repeat. *sigh* I tested it with 2 and 5 and just assumed... I will fix this, thank you! Im fearful that as turbine will see this and make the grind even harder for us, as they already have clearly done so as of HD (theories persist that this was a ploy to force players to buy items off the turbine store as they were far too difficult to obtain easily in game). [highlight][color=black][size=2][B](•_•) Out numbered? Out gunned? first off, thank you for your time and effort to make this guide! Agree a sticky needed for this. I link it in ./world frequently. Many people like me, who now know all about the basic stuff, forget about titles being available for left over tokens in Snowbourne and Wildermore and the Handiron stat legacies. 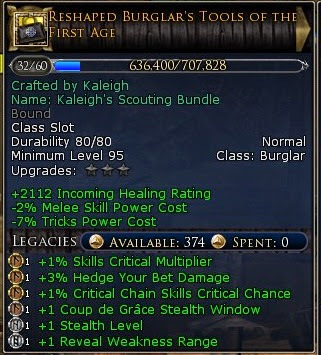 And newer players who want to get to cap quickly often don't put together that crafted legacies for LIs and for refining shards are a great reason to max and guild a craft, even if they have no other interest in doing so. Sometimes longer term players forget what they didn't know and assume it is obvious. But if someone starts fresh these days, that won't have had the exposure to the discussions in game that occurred when the LI, Skirmish, Mounted Combat, etc systems were launched all those years ago. The in game culture of not telling other people how to play is, in the main, a good thing, but it does mean that information like this can remain arcane. Even some kins don't let me their kinmates know this stuff. Great guide - ty Valkrist. Have a general question re. rune relics with -2.5% att. duration: I was wondering why/if this help anything on burglars and gurdians "fast skills". I see u use it for burglars so i take it make a difference. But it can hardly compare to the usefullness for a champion or how does this work out ? I have not visited this for quite a while, I am afraid! Thank you all for the kind words It is wonderful to know that my guide has been helpful! Thank you, and thank you for pointing this out, as that is definitely something I neglected to mention. I will have to check on what the ranges are for the scrolls and add this when I get the chance! That is a good question, and I have not tested it much, to be honest. What I figured is that, when you can, it is good to use relics for things that tend to be more difficult to acquire otherwise. We have 8 pieces of jewelry, 7 pieces of armor, and 2 weapons all of which likely give us Agility, Vitality or Morale, and the other common things. Since Power is not really an issue for us anymore, even just a small increase in attacking speed should make a difference, with no real downside. Even with our skills being 'fast', some are still quite slow, like Flashing Blades and Surprise Strike (especially from stealth). I would guess (hope!) reducing attack duration helps with those still, but I have to admit that I have not tested it at all. I hope that helps, or at least makes sense!